Minera Dead Sea Salt -Unscented - 5 lb | SF Salt Co.
Fine Grain Minera Dead Sea Salt - 5 lbs. Minera® Dead Sea Salt Unscented Fine Grain - 5 lbs. Dead Sea Salt is for BATH/SPA use only and is NOT a food-grade salt suitable for consumption. 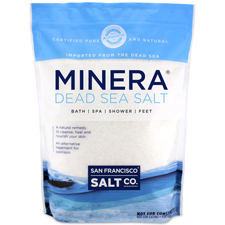 Minera® Dead Sea Salts have become famous for their many natural therapeutic ways to treat and care for your body, due to their unique composition of minerals. Minera® Dead Sea Salts are harvested from the southern end of the Dead Sea in Israel, where mineral content is at its highest. The San Francisco Salt Company has been selling Dead Sea Salt since 2002 and sources only the purest Dead Sea Salt to be used in our Minera® product line. Certified 100% authentic, pure & natural and the exact same salts as used in the spas and treatment centers around the Dead sea in Israel. Minera® Dead Sea Salts have not been processed or refined here in the U.S. We sell only the highest quality Dead Sea salts on the market today. RELIEVE PSORIASIS, ECZEMA & ACNE: A safe, natural alternative to treating skin conditions. According to published studies, about 80%-90% of psoriasis patients visiting the Dead Sea for treatment, experience significant improvement of their skin. CLEANSE, SOFTEN AND DETOXIFY SKIN:�Dead Sea Salt's unique mineral composition gives this salt its therapeutic qualities for skin care. While most sea salts are primarily Sodium Chloride; Dead Sea Salt is comprised of 21 beneficial minerals including: Magnesium, Potassium, Calcium, Bromide and Sulfur. DIRECTIONS FOR USE:�For psoriasis treatment* - Dissolve approximately 2lbs of Minera�Dead Sea Salts into a warm bath and bathe for 20 minutes. Use 3-4 times a week for a period of 4 weeks for best results. The general idea is to re-create the waters of the Dead Sea in your own bath tub. Foot soak - Add a handful of Minera�Dead Sea Salt to a foot bath. Massage for extra relief. Note: Always rinse treated area with fresh water after each Dead Sea salt usage. *Psoriasis Treatment. As with any skincare treatment, discuss with your healthcare professional before use. PURE - ALL NATURAL:�Minera�Dead Sea Salt is the same 100% pure, mineral-rich salt used in spas and treatment centers around the Dead Sea in Israel. Minera�Dead Sea Salt has NOT been mineral depleted or blended with other salts as many "Dead Sea Salts" sold on the market today. Sulfur� A natural disinfectant (constituent of certain vitamins). Potassium A moisture regulator that maintains a neutral environment in the skin. Calcium A building block for corrective tissue under the skin surface. Sodium Relieves stiffness and muscle cramps and maintains neutral environment in the skin. 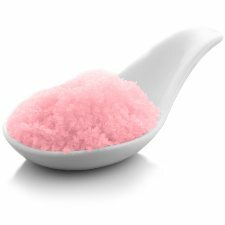 Minera��Dead Sea Salts are ideal for use in bath salts, salt scrubs, home use, & professional spa therapy use.�Minera��Dead Sea Salts�are a standard ingredient for the cosmetic bath and spa industry. Relaxing Bath�- Pour a large handful into a running bath for a relaxing soak. Therapy Bath�- Pour 2 cups into the bath and soak for 20 minutes for a detoxifying bath, skin therapy and/or to soothe muscle aches and pains. Coarse Grain Minera Dead Sea Salt - 5 lbs.